Again, the NFC owns the next several spots, so we have to dig down to #8 to get Fred Jackson's 0.60 WPA. Jackson achieved that in just 10 games, tying him for 4th in the league for WPA per game. His biggest game came in a win over NE with 0.35 WPA. But he also had a very costly -0.30 against NYJ later in the season. Jackson was #15 in total EPA, #16 in SR, and tied for 2nd in YPC with 5.5. Darren McFadden deserves an honorable mention with 0.59 WPA over just 7 games. Wes Welker leads the way for the AFC with 3.28 WPA, accounting for half of Brady's total. His next-nearest league rival doesn't come close, with 2.63. Welker is #1 in total EPA, #4 in SR, #2 in total targets, and #5 in Catch Rate (CR). Welker's biggest day came in the losing shootout with BUF with 0.86 WPA and 24.3 EPA! Rookie A.J. Green is next in the AFC with 1.97 WPA. Green is #8 in total EPA, #16 in SR, and was a deep target over 40% of the time. Green had several big games, but the biggest was in a 24-17 win over TEN. He caught all 7 ball thrown his way. Another rookie, Torrey Smith rounds out the AFC's top receiving corps with 1.94 WPA, barely behind Green. Smith is #10 in total EPA but was only #42 in SR, partially because he was a deep target over 50% of the time. Smith's big game was in BAL's win at PIT. Rob Gronkowski overshadows every other TE this season with 2.75 WPA, nearly double the nearest competitor. He's #1 in EPA, by a lot, #3 in SR, #1 in YPT, and #4 in CR. An amazing season. His biggest WPA day came in the loss to NYG, in which he was good for 0.61 WPA. Owen Daniels is second in the AFC with 1.26 WPA. He's #6 in total EPA and #8 in SR. His biggest day came in a 20-19 win over CIN with 0.26 WPA. For the second year in a row, NE's offensive line represents the AFC with 1.23 WPA. They're #2 in the league in EPA and 6th best in sacks allowed. The NE o-line allowed the fewest tackles for losses all season. BAL's o-line is next best with 0.78 WPA. But they also have a negative EPA, ranking 22nd in the league in that department. The BAL offense is either playing smart, being lucky, or most likely some combination of both. Feel free to delete this - just FYI, Mr. Smith spells his name "Torrey". "Brady took advantage of those opportunities. 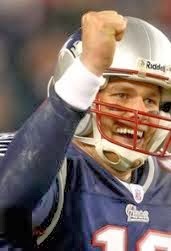 6.15 WPA equates to 0.40 WPA per game--which means his passing game carries his Patriots 4/5 of the way to each victory." Is this a typo? Should that not be 2/5 of the way to victory or am I misunderstanding WPA per game? Each team starts a game with .50 WP, and needs to add .50 more to notch the W. So 4/5 is right. 'Torrey'--Fixed. Thanks. You'd think I'd know that. Brian, you may have explained this before, but is there a reason you do these rankings based on WPA rather than EPA? It seems intuitively like, where individual performance is concerned, EPA is the more illuminating stat. Stated another way, if we don't believe in "clutch" as an attribute, what's the point of rewarding players who just happened to perform when it counted? Clutch is certainly an attribute. Past clutchness just doesn't indicate future clutchness. These are the "MVPs" of this season, and if you just want the "best players" then you can look at EPA. At least that's how I'd look at it. Looking back at Flacco's career, I was surprised to see that he ranked higher in WPA than EPA for the last two years, but higher in EPA than WPA in the first two years of his career (which isn't saying much for year #1). Ordinarily, we would expect a QB with this profile to be undervalued by football's chattering class in years one and two, then overvalued by the same yammerers in years three and four. The tale of Joe Flacco has been the exact opposite. What gives? Yeah, I meant "clutchiness" isn't a skill. What I'm asking is why are we interested in who the "MVP" was if what differentiates him from the "best player" is simply luck. Why are these lists always organized around WPA, rather than EPA? I think it's a case of Flacco being measured against his own past performance. He was a high-EPA QB who quietly took his team to the playoffs two years in a row. The Ravens' big defense got the credit (with high WPA, they may have deserved it). His third season, taking the team to the playoffs became expected... and nobody noticed when he started to live up to it, because the narrative became "he needs to beat PIT". After the drive in Pittsburgh this year, it became "he needs consistency to really excel." His high WPA is probably padded by the comebacks against ARI and PIT, and the three TD passes to Smith vs. STL. Besides, the chattering classes argue the stats when they support the narratives, and they blithely ignore the facts when they'd rather have a pithy narrative. In a league where Tebow can be celebrated, I don't think we can expect a nuanced evaluation of someone like Flacco, who seems to be just good enough and slowly getting better. Solid points, J.R.; your evaluation of Flacco - and your evaluation of the evaluation of Flacco - seems right to me. As a Ravens fan, I'm just glad we've escaped Kyle Boller as our QB of the future. An average QB (especially one who can throw the deep ball like Flacco) is valuable.